If you happen to see a large white rectangular package the size of a record at Trader Joe’s this week, buy it immediately, take it home, and have a party. A KRINGLE party! For some reason, probably because Kringle are shockingly delicious, Trader Joe’s has it seasonally stocked, and I’m here to tell you that you must purchase it. Your life will be better for it. The heck with the party, just eat it all yourself. Kringle, for those uninitiated to the delicacy, is a buttery, flaky, layered pastry, filled with marzipan, and topped with icing. In Denmark, the Kringle was a pretzel shaped pastry (the Danish symbol for a the baker’s guild), but when immigrant bakers moved to Racine, Wisconsin, they reshaped it into an oval. The Kringle is now the official state pastry of Wisconsin. 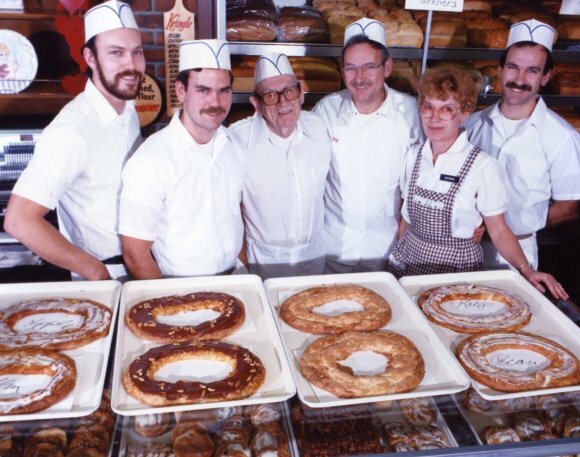 There are two Kringle factories of note: Racine Danish Kringles, and O & H Danish Bakery. There is also a company that makes a Kringle Cream Liquor, which I have not tried, but might taste delicious stirred into morning coffee. You can enter the contest on O & H Danish Bakery’s website to win a kringle, but if you happen to see one at Trader Joe’s, buy it right away, and thank me later. West Coasters, apparently they sell Kringle in Solvang. The last time I was in Solvang was on one of our very first date vacations. Our first evening we had the pleasure of eating Stouffers meals that we purchased at the supermarket, and heated in the hotel – because everything in the town closed by seven pm. I grew up in Racine, WI. Kringle was always available, so we did not seem to need it that often. But, I soon realized what I had missed out on by not eating Kringle while I could. I moved away at age 21 in 1968. I almost fainted when I saw almond Kringle at Joe’s. I was speechless. I expected to see the pumpkin flavor that preceded the far superior almond choice. Please write Trader Joes and ask for raspberry for valentines day. Pecan is also outta ‘dis world scrumptious. I wrote them, they eventually answer. I’m from Wisconsin and road trip home every summer from NYC and stack Kringles in my car. Can’t barely hold back eating them on the way back. PLEASE Traders carry the PECAN kringles. They are the best – always sold out back home. I lived in Racine for 3 years while growing up. We enjoyed so many different flavors of Kringle. I was so happy to see Kringle in Trader Joe’s yesterday. Please, Trader Joe’s, stock Kringles more frequently and try various flavors. Thank-you for having the almond flavor. The Danish in Solvang are like the Chinese in Oakland’s Chinese town. They go to bed very early (everything is closed after 7:00 pm) and get up very early (too early). I was born and raised in Racine, WI. We always had O&H Danish Kringle in our home and we loved all flavors, the best being pecan and raspberry, but all are delicious. I was beyond shocked when I found the same O&H Kringle at our local Trader Joe’s in Wilmington, DE. First is was the almond flavor, but I have since found also the pecan and raspberry flavors. Whenever I go into the store I try to buy at least 4, as they freeze so well and my extended family expects to have Kringle when they visit. I was born in Edgerton,WI and now I live in Bradenton, Fla…When I go back home to visit my sister always picks up a kringle or two! OMG they are so good! I wish I could find them here in Florida or maybe I’m just not looking hard enough. I purchased a Kringle at Trader Joes in the Pittsburg Plaza, NY. Went back for another and found they are seasonal here. Well, I’ve been wanting to know when they are in the store. I need a Kringle!!!!!!!! !